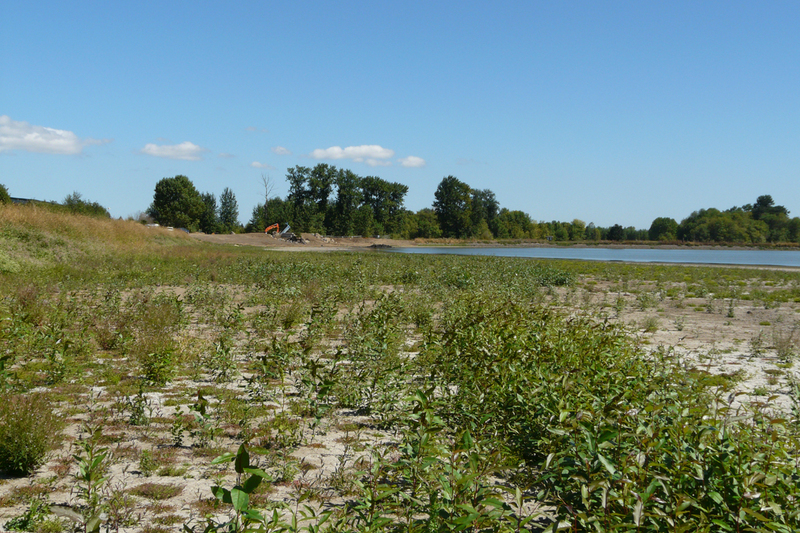 Exciting changes continue at Fernhill Wetlands (Birding Oregon p. 61). 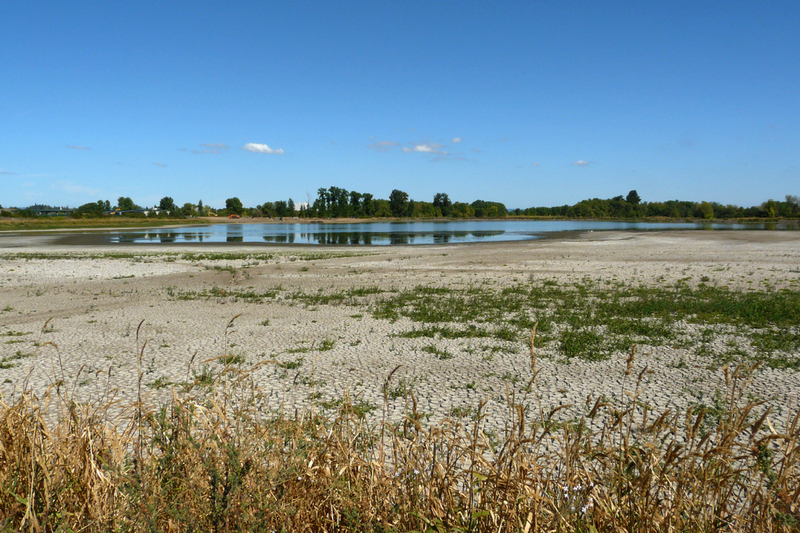 This photo is from the drying lake bed of Fernhill Lake. 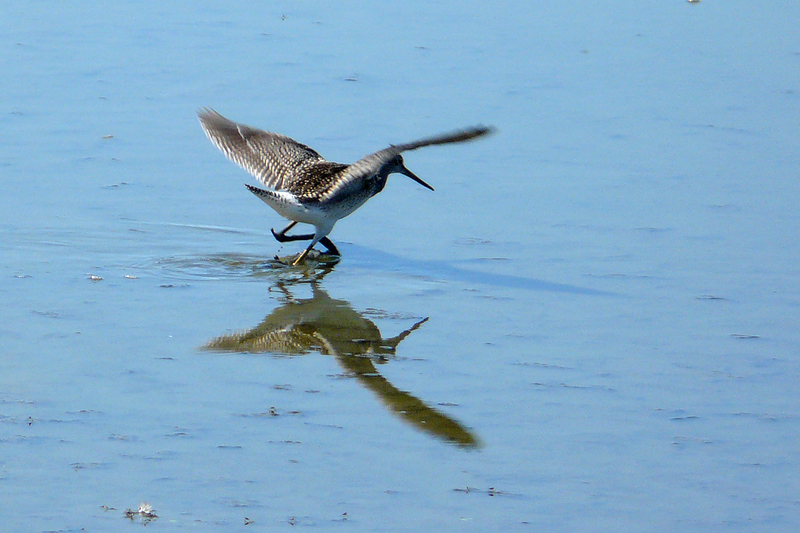 Low water levels this summer have created some great shorebird habitat. Notice the clump of cottonwood trees that have sprung up already. The construction (note the equipment in the background) will create rocky waterfalls that will cool and aerate the water that flows into the lake. I will be leading a free tour of the site on Saturday, October 6, at 10:00 AM as part of the Birds and Beer at Fernhill Wetlands event. Click on the Classes page for more details. 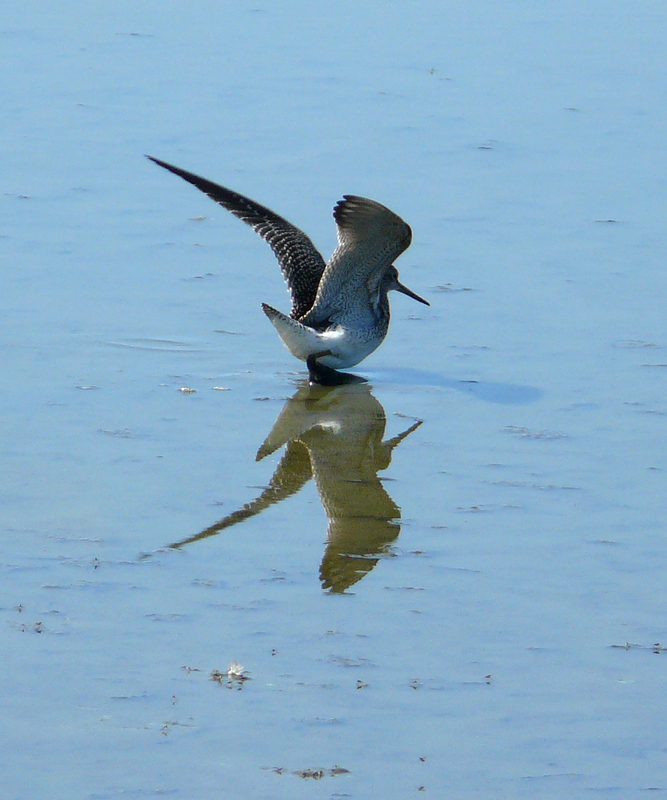 In addition to creating shorebird flats this summer, the low water levels are also helping to purge the lake of carp, which compete with birds for aquatic prey and muddy the waters with their feeding habits. 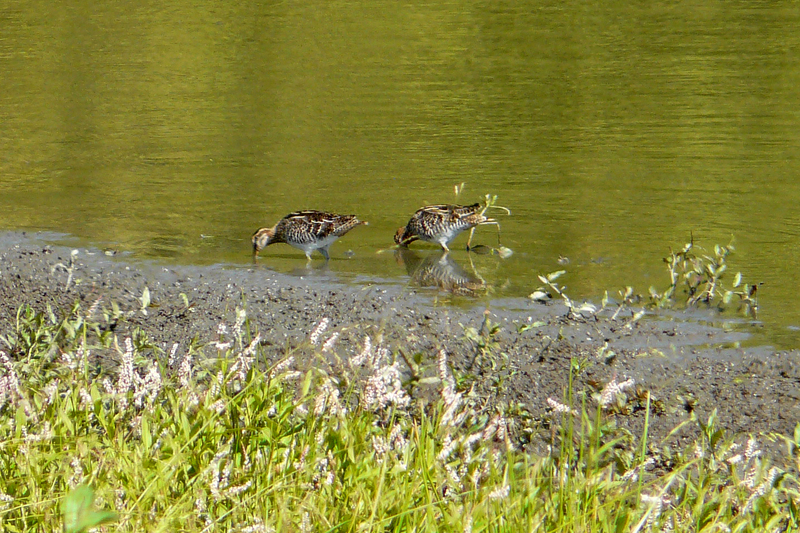 In the Mitigation Marsh, two Wilson’s Snipe were feeding out in the open, which is rather uncharacteristic of this species. 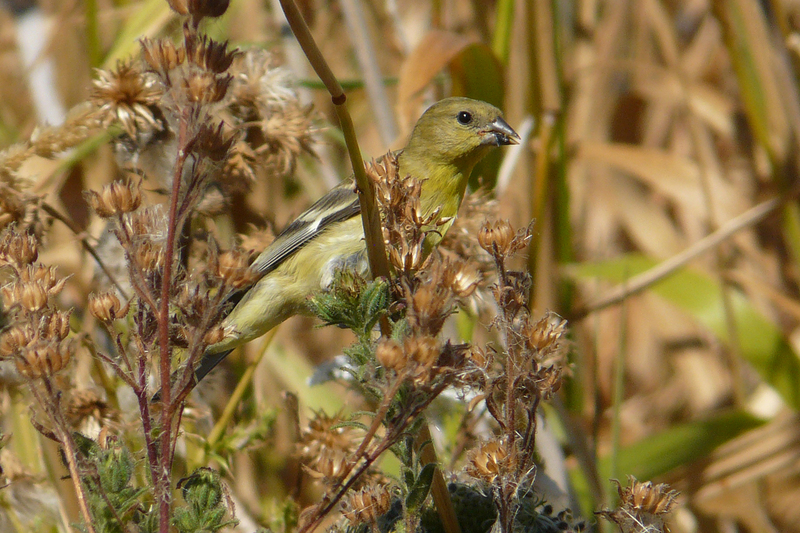 On this visit, a flock of Lesser Goldfinches was working the weedy patches. It is always a treat to get close looks at these birds. The coming weeks should see increases in sparrows, shorebirds, waterfowl and raptors. 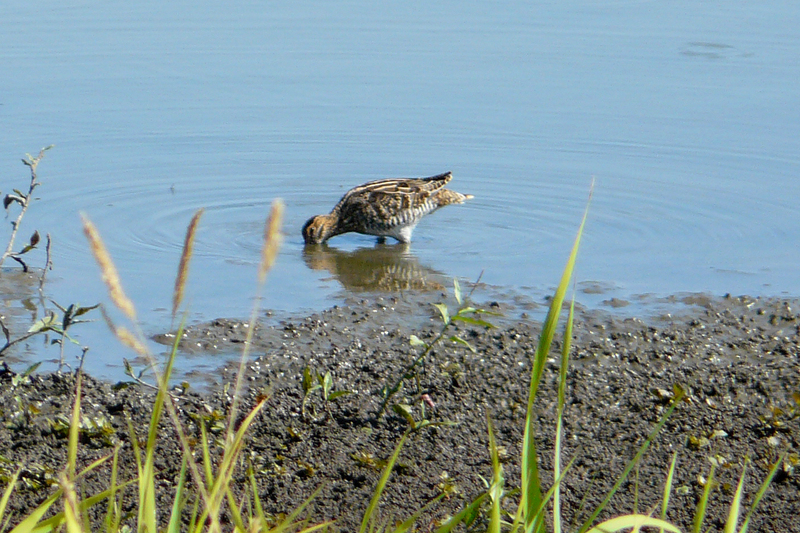 This entry was posted in OR Birding Sites, seasonal movements and tagged Fernhill Wetlands, Greater Yellowlegs, Lesser Goldfinch, Wilson's Snipe. Bookmark the permalink. Ok John, I’ve really held back on this stupid question, but it has been really bugging me for as long as i have been following your blog. I personally talked to Fred about this this spring while we birded Malheur together and he has never released a second edition of Birding Oregon (Copyright 1978 Fred L. Ramsey). Just where do you get your page numbers? 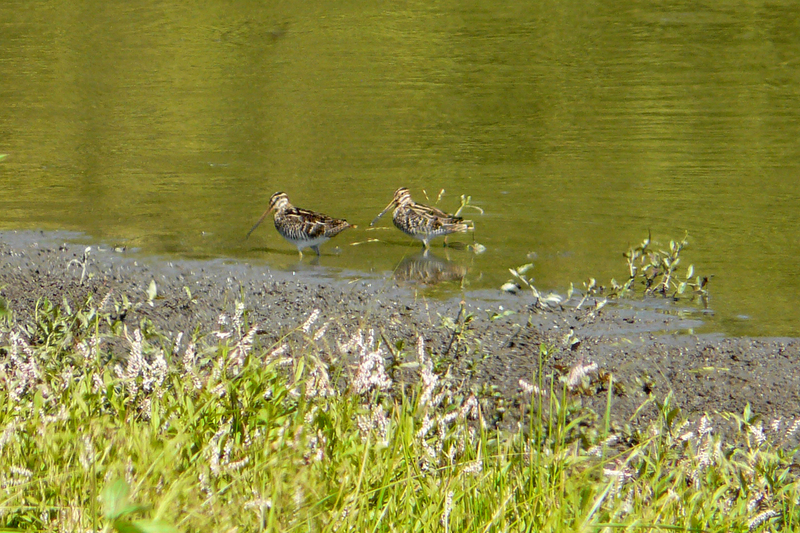 Take today for example: page 61 of Birding Oregon is section IV, part D, Rogue Valley. In fact i have never been able to match any of your page references to the book. Every time you mention a place to go, i go look it up and just throw up my hands — it NEVER matches. Fred doesn’t even mention Fernhill! This is a no-brainer for me because i know where it is as i live in the area. I am just constantly befuddled by your references. I’m sure there is an explanation that i’m overlooking and would really appreciate you clearing this up for my simple mind. It is currently out of print, but used copies are available on Amazon. Well then, that explains it. I read your entries through an RSS feed so i’ve never seen your side bar. Thanks for clearing that up for me. Pretty simple, two books, same name. That never occurred to me. 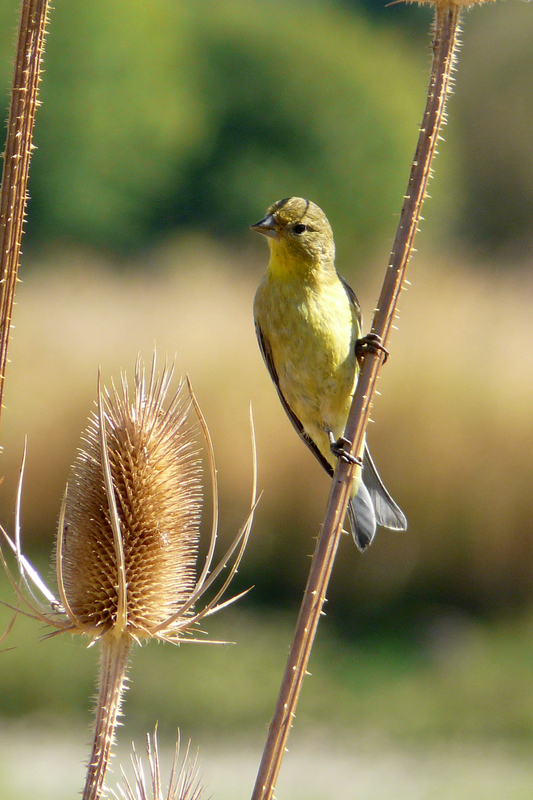 Really nice shot of the finch in the Teasel, by the way.